John has been in the upholstery business here in the Cowichan Valley since 1974, originally de Haan's Upholstery with his father. We are capable of doing minor repairs for local furniture stores as well as recovering individual pieces/sets brought in by customers. We have an extensive selection of fabrics to choose from as well as remnants when recovering your project. John will do a free estimate for you, however, he will need to see the piece in order to do so. Shirlee has a background in apparel manufacturing. She ran Lisnacree Custom Sewing and Manufacturing in Duncan, before starting Top Stitch Manufacturing in 2005 with John. 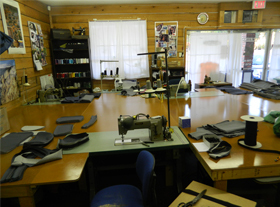 Shirlee provides service such as alterations, pant hems, even repairs to horse blankets. Our Custom Sewing department is capable of taking any ideas that you may have and turning them into a prototype. Our main focus, however, is with industrial contracts. We have a few large contracts that require stack cutting and production line assembly. With our industrial machines we are able to turn out both large and short runs depending on what you require, at the same time making it financially viable. The larger the numbers equal the better price for you. Feel free to bring us your ideas. Inside Top Stitch Manufacturing inc.